The Brazilian jazz scene has undergone subtle but noticeable changes, as many Brazilian musicians continue to travel, tour, and study abroad, returning with applicable innovative ideas. Expanding beyond the customary bossa and samba boundaries, the music is encompassing global influences with impressive results. 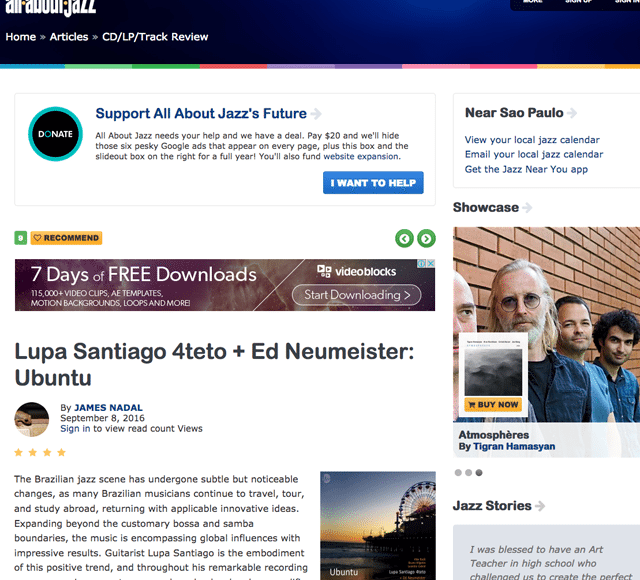 Guitarist Lupa Santiago is the embodiment of this positive trend, and throughout his remarkable recording career spanning seventeen records as leader, has been prolific in presenting original jazz compositions, under a variety of ensemble formats. With Ubuntu, Santiago expanded upon his quartet by inviting trombonist extraordinaire Ed Neumeister, for an unusual yet stimulating session. Santiago met Neumeister while on a European tour, and as the trombonist was coming to Brazil, the scenario was set for a musical collaboration, with Neumeister contributing four of the seven songs. Recorded at Studio Soundfinger in Sao Paolo, the country’s state of the art facility, they utilized a live recording approach for maximum musician interaction, the music retaining its vitality and spontaneity. “Probably Maybe,” is one of three Santiago numbers, and as the gracious host, allows Neumeister to set the songs mood and tone, with opening trombone expressions. Pianist Leandro Cabral ignites the improvisational section, before the trombone makes a lively return. Santiago comes in with his own solo, leaving no doubt that this will be a straight ahead jazz excursion. The staggered intro of “Dauphine,” yields into a softer guitar passage, set against interesting tempo variations. Neumeister also composed the pensive “Night Eyes,” where he converts the singular trombone into an orchestral foundation, then solos with aggression. “Two For Eleven,” is an animated offering with the trombone and guitar enjoying thoughtful and captivating exchanges. Pianist Cabral penned “Trails,” and lets the others battle it out before giving himself some room at the end. Built around sustained chords, “Enfim SUS,” spins around the bop idiom, with intense propulsion from drummer Alex Buck and bassist Bruno Migotto. As required in a rhythm section, these two display an intuitive sense of urgency to keep the action in the appropriate direction. Following a transfigured rock time signature, “Eco System,” plays fast and loose, and ends the repertoire on an upbeat. Trombone and guitar combos are not that common, so this recording was admittedly approached with some trepidation, maybe instigated by fear of the unknown. Not that familiar with the works of Santiago and Neumeister, and possibly expecting more of a Brazilian edge, it revealed itself to be not only a pleasant listening experience, but an educational one as well. Track Listing: Probably Maybe; Dauphine; Night Eyes; Two For Eleven; Trails; Enfim SUS; Eco System. Personnel: Lupa Santiago: guitar; Leandro Cabral: piano; Alex Buck: drums; Bruno Migotto: bass; Ed Neumeister: trombone.